It was opened on the 13th of July, 1885, the magnificent national museum of the Netherlands; the Rijksmuseum in Amsterdam. And it was festively re-opened on April 13th this year, after an almost 10 year renovation that brought the interior back to the old splendour from under white wash that came with 20st century “modernisations”. But even more important: it has been two months since the underpass for bicycles was re-opened on 13th of May, 2013. 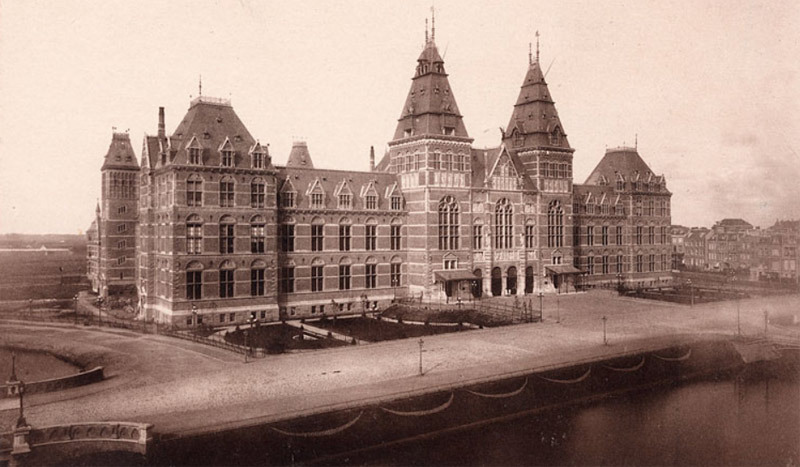 The Amsterdam Rijksmuseum in1885 was then located at the edge of the city. The Rijksmuseum was built as a national exhibition building mainly to display the paintings of 16th and 17th century Dutch masters. At the time, other architects looked down on it. They called it a ‘medley of styles, with its renaissance-style arches, Neo-Gothic windows and medieval towers, out of step with contemporary life’. Architect Cuypers won a design competition, but even the king despised the building. He called it a catholic cathedral and as a protestant he refused to attend the opening. This controversy resembles the discussions about re-opening the underpass for people on bicycles that culminated late 2012 and continued until the final re-opening this May. The great-grand daughter of the stubborn king, Queen Beatrix, did come for that re-opening, the last museum she would open during her reign.